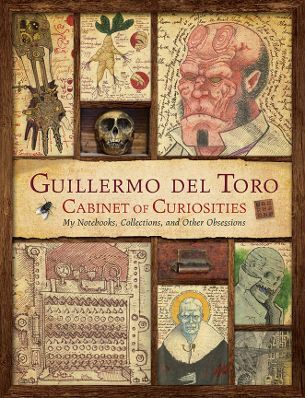 Cabinet Of Curiosities book review . Guillermo del Toro is not only one of the most thoughtful and talented filmmakers working today, but one with the most consistent concerns, repeatedly revisiting the same obsessions. This pricey but eye-pleasing compendium (subtitle: My Notebooks, Collections And Other Obsessions ) provides valuable insights into what fires his imagination. First it leads you on a fascinating guided tour of “Bleak House”, home of Del Toro’s collections, where original art and objets d’arts sit side by side with kitsch toys and personal mementoes. As the director puts it, referencing Citizen Kane , it’s “like Xanadu if Kane’d been a 13-year-old geek”. It’s a delight to discover that del Toro usually writes in a room containing a life-size statue of Boris Karloff enjoying a cuppa as he sits in the make-up chair - a room which uses sound effects and projection to simulate a dark, rainy night! The second half allows us to peek into del Toro’s now famous notebooks, brimming with ink sketches and handwritten notes - with footnoted translations from Spanish where necessary. There are even a few brief, tantalising glimpses of his plans for unrealised projects, such as his endlessly gestating HP Lovecraft adap, At The Mountains Of Madness . All this is placed into context by illuminating, erudite discussions with the director about everything from the art of screenwriting to his childhood love of the taste of crayons, and musings by the man himself on subjects such as symbolist art and the great horror writers. Short of taking a tin-opener to Del Toro’s skull, you couldn’t get a better look inside his head.